Can be found underground, fastest way down would be jumping on the webs at 22,42 north of Falanaar (middle of the crater). I actually had troubles finding this guy while its actually REALLY easy.. There is a big hole in the ground, that drops into some ruins infested with spiders. The center is about 21.9, 42.2. Sanaar is down there, in an alcove, around 41.4, 35.2, Falanaar Ruins. 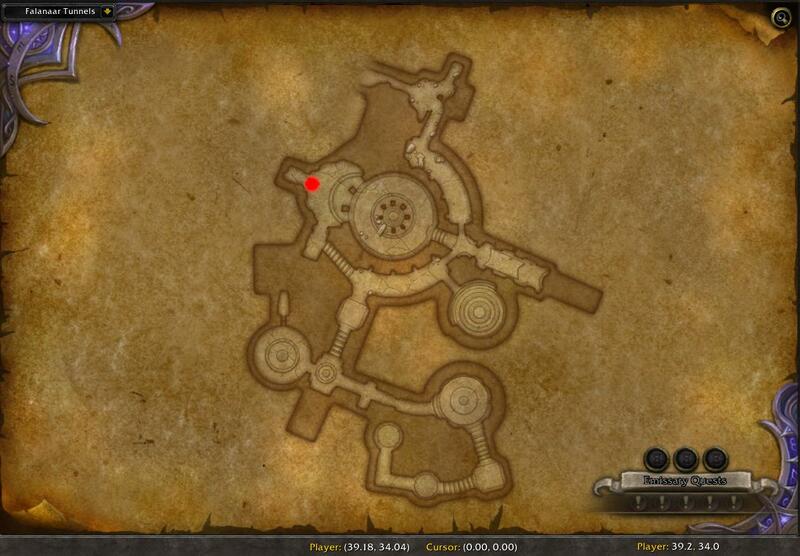 I'm having trouble triggering the quest I'm standing right on top of it, but nothing pops up. -Straight through the centre of the room at the bottom, across the "bridge"
Ran into an issue where I completed the Withered Training quest first and then tried going back into Falanaar to do this quest and Skittering Subjects and the ruins were empty, no spiders, no Sanaar, and the locked doors still said I needed to have withered to open them. I relogged and it took me back in to Shal'aran and after that I was able to use the teleporter to get back to Falanaar and everything was back up.